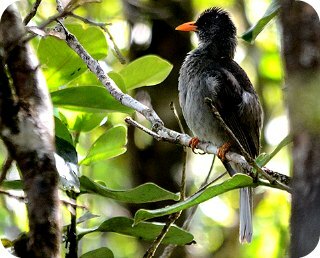 The Mauritius Black Bulbul is a passerine endemic to Mauritius island. Introduced predators and non-native plants coupled by habitat loss and degradation caused its population size to shrink. Conservationists believed that approximately 200 pairs existed in the mid-1970s. In 1994 the species was classified Vulnerable on the IUCN Red List due to its very small population. Anecdotal evidences show that the species' range and population trend is stable and it is presumed they will remain such. The birds' population, which is estimated to be roughly 840 individuals, is increasing in some regions and decreasing in others. They have dull plumage comprising shades of olive green and grey, bright yellow-brown eyes, pink legs, a black crest and an orange to yellow hued bill. Generally it prefers the native forest of Mauritius, but it also forages in forest margins, degraded forest remnants with exotic trees, secondary scrub and exotic plantations. It is largely frugivorous, but also feeds on arboreal insects such as bush crickets, butterflies and caterpillars and small vertebrates like geckos. 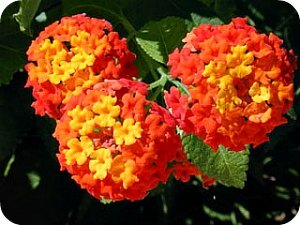 The ripe berries of the West Indian Lantana (Spanish flag), a non-native and invasive plant, are particularly favoured. Habitat degradation and loss caused by the destruction of native forest, particularly for the plantation of tea and through invasion by exotic plants. Destruction of nests, eggs and chicks by tropical cyclones. The species is responding well to rehabilitation of native ecosystems in Conservation Management Areas, which has included exclusion of introduced animals and replacement of exotic plants with native species.